Snap Inc. has launched its Snapchat Discover Section in Ireland, continuing the international expansion of its video hub. The company has partnered with Irish Independent, Joe.ie, Off The Ball, Foil Arms & Hog, MetDaan, and eir sport, who will produce vertical content for the video hub, which has seen time spent on the platform triple since the beginning of the year. The new partners will launch a mix of Publisher Stories, which are magazine-like content created by an in-house editorial team, and Shows, which are 5-7 minute stories filmed or edited into a vertical format that can be found on a dedicated profile page where users can access all available episodes and seasons. The expansion of Snapchat Discover and the launch of local Irish content comes just a day after the social media company announced 17 new partnerships and the launch of 25 new shows from the U.K. The news follows Snap’s Q3 earnings results earlier in the week, which saw the company lose 2 million daily active users despite posting its best sales quarter to date. It was the second straight quarter of declining daily user growth for the company, which attracts 186 million daily users across the globe. James “Whitey” Bulger, the notorious Boston crime boss who was serving a life sentence in prison and who also served as an informant to the FBI, died on Tuesday at the age of 89. His story has inspired a handful of gangster characters across film and TV, including one direct adaptation of his life story. Jack Nicholson’s role as mob boss Frank Costello in Martin Scorsese’s Boston gangster drama “The Departed” is very loosely based on Whitey Bulger, though Scorsese’s film is actually a remake of the Hong Kong film “Infernal Affairs” from 2002. Jason Isaacs and Jason Clarke played two Irish-American brothers, one a crime lord and the other a politician, in a drama inspired by the relationship between Whitey Bulger and his brother Billy. “Brotherhood,” however, is set in Providence, Rhode Island as opposed to Boston. NBC’s drama starring James Spader as the country’s most notorious criminal Raymond “Red” Reddington was inspired by Whitey Bulger’s capture and his relationship as an informant to the FBI. Spader’s portrayal, though, may have a bit more Hannibal Lecter in him than Whitey Bulger. James Woods portrayed a Bulger-esque Boston crime boss named Sully Sullivan in the first season of the Showtime drama “Ray Donovan.” Woods donned a wicked Boston accent opposite Steven Bauer before meeting an untimely end at the hands of a double crosser. Joe Berlinger’s documentary captured the trial of Whitey Bulger to use as a springboard to make a broader point about corruption within law enforcement. He examines the extent of Bulger’s close-ties and relationship with the FBI and the Department of Justice as an informant. 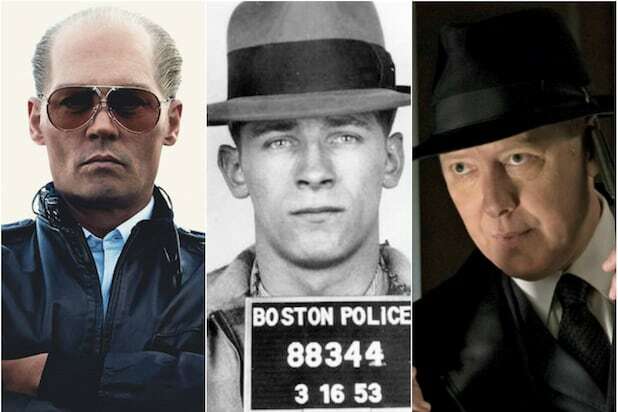 Director Scott Cooper finally brought the true story of Whitey Bulger to the screen in the 2015 drama “Black Mass.” Cooper recruited Johnny Depp to give a vampiric performance as the ruthless mob boss, with his character’s thin hair, heavy makeup and massive forehead doing some heavy lifting.